HAPPY MARDI GRAS TO THE WORLD!!!!!!!!!!!!! That’s it, just HAPPY MARDI GRAS TO THE WORLD!!!!!!!!! 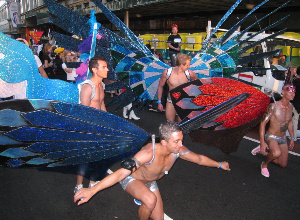 Sydney’s legendary Mardi Gras Parade and Party, traditionally held on the same night, are now planned on different weekends for 2010. The Parade is scheduled for Saturday 27 February, then the Party will happen the following weekend – Saturday 6 March. “In a move designed to make Mardi Gras an even more attractive event in the calendar of Sydneysiders and the world’s gay travelers, New Mardi Gras plans a more concentrated two-week festival, curated in tandem with its many arts partners,” explains Festival executive producer Danielle Harvey. As part of the shorter festival, Sydney’s popular Fair Day will be held on Sunday 21 February, and the Harbour Party by the Opera House will be on the day after the Parade, on Sunday 28 February. The Festival’s official 2010 theme will be ‘Mardi Gras’ History of the World’, aiming to incorporate LGBT people’s stories through the ages and provide a gay take on some of the great moments and figures of history.